Automate repetitive tasks and keeps your Inbox clean with EmailPet so you can focus on what's important. With Mobile being everywhere these days, no automation solution would be complete without the ability to send SMS Texts. 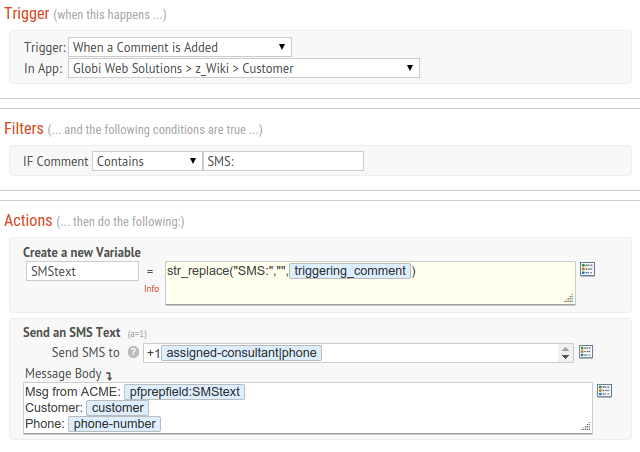 Your Flows can send Text Messages to mobile phones and can include your Podio data. Not only can you send SMS Texts, but replies to these Texts can trigger additional flows to file and/or act on those replies. When a new customer item is created, one of our internal consultants are assigned. We then want to dispatch this Customer information to the Consultant using an SMS text. Once the Consultant contacts the Customer and sets up the initial meeting, a reply is required on the item to update the item status to "Contacted - Initial meeting scheduled". To send an SMS, there are a couple different ways you can set up your Podio App and Flow. 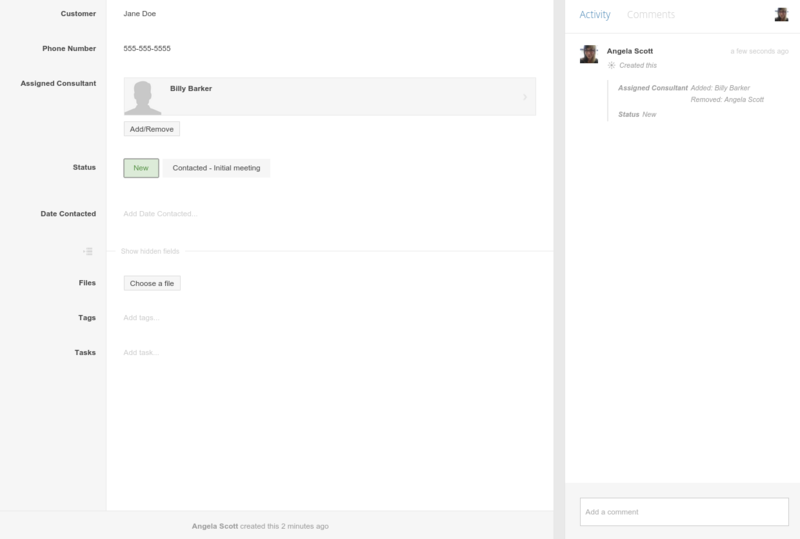 For the sake of this example we are going to set up a flow to trigger on a Comment to the item. We will start the comment with "SMS:" and type a custom message and hit send. The Consultant can reply to the text, adding a comment to the item as well as updating the status. First, set up the flow to send the SMS Text message. For this example, we chose to trigger off Comment of an item. We added a filter for this Comment to contain "SMS:". Of course, we do not want to send the "SMS:" portion so we created a Custom Variable and a string replace PHP evaluation to strip this out. Then we added the Send SMS action. Note: The phone number that the SMS text will be delivered from will not be a recognized number to the receiver. Adding "Msg from your-company:" text to the beginning of the text is recommended. 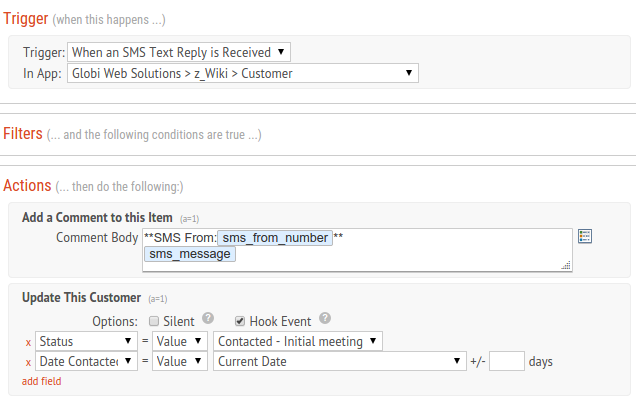 Second, a SMS reply type flow needs to be set up in order to receive replies from the sent text. No filters are required and add a Comment action. Using the field tokens, select the SMS message and phone number and add it to this comment. For the sake of this example, we are also updating the Status of the Customer Item. Check this out in Action! Owner of Globi Web Solutions, and Podio Fanatic. "Podio" is a registered trademark of Citrix Systems Inc.